By now, you should be well aware that Microsoft is planning to remove support for the RPC/HTTP protocol in Exchange Online, starting Oct 31, 2017. In case you’ve missed the announcement, multiple blog posts and the support article, you can find a nice summary for example here. With less than two months remaining, most organizations have already moved away from older Outlook versions. If you are one of those that are yet to tackle the issue, there is some good news – Microsoft has released a report that should help you identify the users that are connecting to Exchange Online via RPC/HTTP. 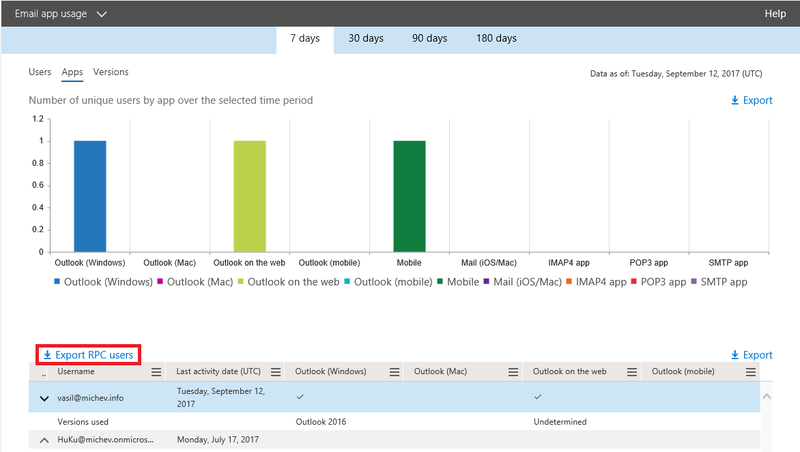 The report can be found under the Office 365 Admin Center -> Reports -> Usage -> Email app usage, or by clicking here. Clicking the “Export RPC users” button will initiate a download of the CSV file, containing the needed information. Unfortunately, in my case there aren’t any details to show, as the tests I performed with older Outlook clients are yet to be reflected in the report (you can as well expect delays of few days, but after all it’s the historic data we’re most interested in). Rest assured though, the report works OK, as showcased by some good folks at Microsoft. Unfortunately, there seems to be no way to export this report via PowerShell or access it by any API. There you have it! This has been a much requested functionality, as previously the only way to gather information about RPC/HTTP usage was indirect – one had to enable mailbox auditing and crawl the entries to gather the client version. 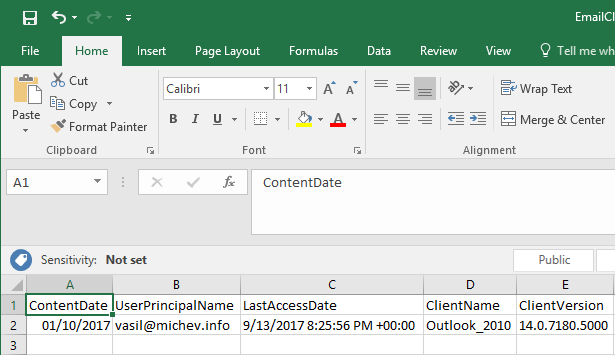 Connecting with specific Outlook version itself doesn’t necessarily indicate that the user will be affected, but at least gives you a clue on which users to focus. This entry was posted in Exchange Online, Office 365. Bookmark the permalink. When I run this report it gives me a bunch of numbers like a guid instead of a UPN in the User Principal Name section. I’m not sure how to use this number to find the actual user. You are probably using the “anonymization” option. Check under the O365 Admin Center -> Settings -> Services & add-ins -> Reports -> Display anonymous identifiers instead of names in all reports.